Spud the Piper. Scottish Bagpiper Wedding Ceremony Music. Bagpiper for Inverness Wedding. Voting is open for Spud the Piper! 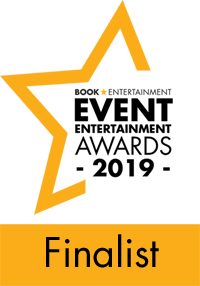 Spud the Piper is excited to announce that he has been named as a Finalist for The Event Entertainment Awards 2019. He has been chosen as a Scottish finalist in the Best Entertainer Finalists category. The Event Entertainment Awards are presented by bookentertainment.co.uk and recognise the best in the event entertainment industry across the UK. The winners will be chosen by a panel of expert judges and community votes. Since 50% of the final score comes from community voting, Spud needs your support to help him win the award! Please visit the finalist’s page and vote each day. Once on the finalists page, you can vote by clicking on the Scotland link. Voting is open until April 30th. To vote now just click here. Spud the Highland Bagpiper is renowned for his Scottish wedding ceremony music and highland bagpipe music at weddings, receptions and special events throughout the world. For over 15 years Spud has had the pleasure of providing professional bagpiper musical entertainment globally at traditional castle, Scottish and highland themed weddings and special events. Highland bagpiper Spud, also known as Callum Fraser, lives in the county of Inverness in the heart of the beautiful Scottish Highlands with his wife Karen and young son. Spud has played the bagpipes at weddings and other events throughout Scotland, the UK and the world, at Burns Suppers and St Andrew's day events. Spud has been honoured to perform for many celebrities including Madonna, Ashley Judd, Jamie Lee Curtis and a host of other stars. He would be equally delighted to play for you on your special day! No stranger to receiving awards and accolades Spud the highland wedding piper has been delighted to be recognised many times at both the VOWS Awards and the Scottish Wedding Awards. "Spud The Piper is one of the wedding industry's best known characters, partly thanks to his appearances on national television and in newspapers after serenading Madonna with his bagpiped version of 'Like A Virgin' when she arrived in Scotland for her wedding. But it wasn't Spud's celebrity connections that won over his customers, it was the wide range of musical styles he was willing to play and more generally his sheer musical talent as a bagpiper - couples were simply bowled over by his obvious musicianship and highly toned performance skills."